Ok, season 4 please. Thanks. If you apply for 4, there'll be 4 apps in total and we'd only need one more. Once Tinuviel's sheet is finished, season 4 will be nearly complete. Arachobia, I added Kesh's character sheet. Should be all set, aside from a few tweaks I was thinking of in the backstory. Guys, join up. We're having a blast in Arachobia's thread. Heavily revised Tormur's background to simplify, but he should be all done now. Ideal: All creatures have a place in the world, so I strive to help others find theirs. Flaw: I have absolutely no patience for slowpokes and those who prove indecisive. As Ethlin kneels down by the crystal clear pool to get a drink he takes a quick look at his face. He smiles when he sees a small smudge of dirt on his young, fresh elven face. He has a thin jaw that is devoid of any facial hair, his crisp blue eyes are almost invisible due to the reflection of the sky in the water. He takes some of the water in his small hands and washes his face. Life in the woods with his fellow nomads can be messy work. He then takes his drink and stands up. 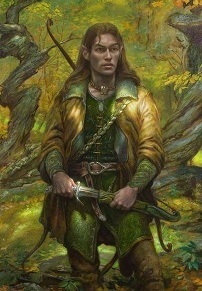 He is average height for an elf and very svelt from his time honing his skill with the bow. After quenching his thirst he hears a barely audible sound in the woods and vanishes into the foliage. Life with the around Ethlin is fun, and despite his near immortality from his elven heritage it is a surprise that he is still alive with the risks he takes. He loves being outside and usually found in the woods near where his tribe has camped either scouting for food or wandering around getting into trouble. He has learned to trust his clansmen, and around them h eis pleasant and even fun. Around outsides he is distant and cool. He takes his time to assess each person outside of his tribe and will only trust those of exceptional character, in his mind. Despite flighty nature he is extremely patient, if he has a goal oro an objective he can do a task for an eternity which has made him a valuable tribes mate. Ethlin is not a native of the Tickleberry Nomad tribe. Ethlin was born to a noble elven family, the youngest of 3 children and easily the most spoiled and arrogant. He was taught fencing and archery from the finest teachers, he was taught forestry and stealth by the strongest rangers but Ethlin was aloof and didn't care. He used his skills to steal and get into places he was restricted. His parents thought he would out grow his childish attitude but Ethlin had no desire to do so. One evening he broke into a forbidden temple and stole a sacred pin and hid it. When he was caught, in his arrogance he refused to turn over the trinket and was banished from the grove. Ethlin shrugged and left, recovering the pin from it's hiding spot. He left the grove with eager haste. He wanted to see the world and fled to the closest city he could. It was in this city that he really used his skills to get what he wanted. He learned all there is to know about guild life and being a thief. He was quite good at hiding and getting into trouble and was willing to do just about anything. After a job gone wrong he was scapegoated by his parenter and had to flee. He fled into the Quiverng forest and thought to seek out his own kind again. But in his anger and haste he was careless and stepped into a hunters trap. It snapped on his leg and despite his efforts he was unable to get free. Days went by and he thought he was going to die. That is until some children from the Tickleberry tribe stumbled upon him and found help. He was taken to their camp and nursed back to health. He was offered a home from the tribe and he accepted, he figured it would be a temporary place to hide, and maybe these people could be fleeced of anything valuable they had. A couple weeks turned into months, which turned into years, and now after 70 years there isn't a nomad alive that remembers when Ethlin arrived. Ethlin comes and goes, but he is never gone for more than a few months. He helps the tribe by using his skills to keep them fed, and keep them safe. In the last 70 years he has changed a lot and doesn't really talk about his pre tickberry life. A time will come when he needs to use his full skills again but until then he will do what he can to respect the tie to the giants and watch over his beloved tribe. Last edited by Stonk; 01-08-2019 at 03:50 PM. I agree! Get into a game. We are having a great time! 2 Personality Traits: I’m driven by a wanderlust that led me away from home. Ideal: Freedom. The sea is freedom—the freedom to go anywhere and do anything. Flaw: I’m convinced of the significance of my destiny, and blind to my shortcomings and the risk of failure. Appearance: Just shy of 6' tall, Jamkas has greenish-blue skin and shaggy dark hair that almost looks black indoors, but has a very distinct green hue in direct sunlight. His eyes are a vibrant crystal blue. He is quick to smile and his appearance would not be remarkable if it wasn't for his coloration. Personality: Jamkas is a free spirit in general who enjoys travel and adventure. However his recent experiences have instilled a slightly more serious side to him as he has embraced a mission to fight evil and keep nature in balance. History: Darhana was a young widow who had tryst with a mysterious stranger who had come upriver from the Inner Sea. Jamkas was the result of that union though his father was long gone before Darhana even knew she was pregnant. The child originally did not look particularly abnormal, aside from his strikingly blue eyes and a strange hue to his hair that was only visible in the brightest light. Jam grew up as a dock rat, learning all he could about the ships, working odd jobs when he was old enough. When he came of age he joined a merchant ship traveling around the Moonsea. His third tour on board took his ship to the Inner Sea where misfortune befell them and the ship sunk. Injured by the falling mast he was flung into the sea. When he awoke, in a panic underwater, he found to his shock that he could breathe. He was being cared for by a small community of aquatic elves, being he had never before heard of. They claimed that their god. Deep Sashelas, had preserved him. He lived with them for nearly a month, beneath the waves, learning their religion and coming to the conclusion that his life had been spared for a reason. He had a great purpose, something beyond being a mere sailor. He was to bring the knowledge of Sashelas to the surface, to fight evil in his name, and to maintain the balance between man and nature. It wasn't until he returned to the surface to look for passage home that he became aware of the change that had overcome his appearance. His skin and hair now sported the colors of the sea and depths. Last edited by Bigbywolfe; 01-10-2019 at 03:35 AM. With Bigbywolfe's app, season 2 is almost filled.